You all know photographer Dorothea Lange. If not Dorothea herself, you’ll recognize her famous candid photos taken during the 1930s highlighting the struggles of Americans suffering during the Great Depression. Her iconic Migrant Mother and the series of photos around that image depict the desperation many felt during the period. 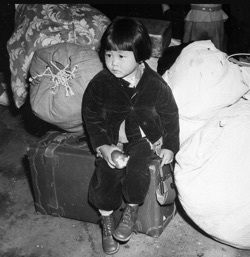 Later in 1942, she was hired by the US government to capture images of the relocation of Japanese-Americans affected by President Roosevelt’s Executive Order 9066. Thousands of American citizens were being stripped of their civil liberties, their businesses, and their homes before being placed in internment camps scattered around the country.